I’ve said it before and I’ll say it again: it doesn’t even matter what happens in Vegas, you can’t not love it there. Everything in the city is immaculate and grand. No matter where you look, you’re entertained, and no matter where you go, you’re having a good time. It doesn’t matter if you gamble or not, drink or don’t, or are looking for relaxation or want to go and do, see, and BE it all. Business? Pleasure? A mixture of both? It simply does not matter what happens in Vegas — you can’t not love it there. On my last visit to Vegas, my husband and I stayed at two hotels and did a site visit on a third. If you’re planning your next trip, these three are all great to consider, among many others! You walk in the place and you’re practically drowning in class. From floor to glass-blown ceiling, I promise you, you’ll be impressed. The place just oozes that classic Vegas feel, so if that’s what you’re looking for, you’ve done it. The resort & casino is distinguished and elegant; “designed to mesmerize,” says the website -- I concur. The restaurants, casino, pools and clubs are all grand both in scale and design. And of course, the prominent fountains’ beauty goes without saying. One (1) $50.00 Food & Beverage credit & one (1) $50 spa credit per room, per stay. Certain restrictions may apply. Not combinable, not valid on room rate, no cash value if not redeemed in full. Not valid on taxes, gratuity or merchandise. Step only one foot in the door and you’ll feel completely confident that you’re in the perfect place to have a good time. A great time, actually. The Cosmo has a head turning, neck breaking urban design that I just know people in their 20s and 30s will fall in love with. Expect to check into your residential-styled room to find the perfect launch pad for the time of your life. If you want chic, class, and a chance to see the biggest and most beautiful chandelier of your entire life -- you want Cosmopolitan. 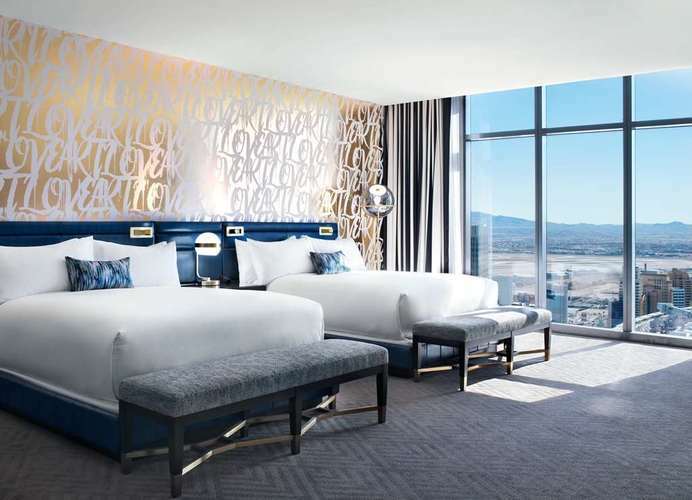 On the surrounding walls of the property, you’re in the heart of the Las Vegas Strip — I’m talking prime location and walking distance from anything you could ever need. Step within the walls of the property and be immediately transported into a soothing oasis in the midst of all chaos. Like magic. Experience Mandarin and experience sleek design risen high above the city lights. You’ll notice subtle Asian-inspired touches throughout the non-gaming, non-smoking resort. Unique is the best word I can use to describe Mandarin Oriental; beautifully, and honestly unique. Wondering what other Virtuoso-like properties there are in Vegas? Click here. Thanks for subscribing to BE!